Catamarans Market size is estimated to exceed USD 2.2 billion by 2024; according to a new research report by Global Market Insights, Inc. Growing demand for high-performance ships owing to increased recreational boating activities such as boat racing, sailing, and motorsports are propelling catamarans industry growth. Rising disposable income has in turn fueled the overall spending on luxury, comfort, exploration of new routes. Moreover, participation in recreational sporting events are expected to positively instigate the global catamaran market growth. Growing popularity of recreational boating sector, specifically in North America and Europe, increasing numbers of aging boats, economic improvement, architectural development, and technological advancement are among key factors fueling catamarans market share. According U.S. National Marine Manufacturer’s Association, France contributed around 60% of the globally manufactured catamarans. In 2017, powered catamarans market accounts for 943 units and have gained strong attention in high-end consumer segment owing to high-speed and efficient performance for longer routes. Powered ships offer consistent speeds without the requirement of wind in comparison to conventional sail models with highly comfortable ride. Owing to these factors they have found substantial applications as means of passenger transport and defense applications. South Africa exports over 90% of the nation’s production. Other key manufacturing countries include U.S., Sweden, Netherlands, Germany, UK, and South East Asian economies. These nations have witnessed consistent increase in the production units every year with added convenience and comfort. In conjunction with this, players offering customization in accordance to the client requirements to boost the consumer motivation is propelling the overall catamarans market share. Sailing catamarans market value is projected to witness 5.8% CAGR over the forecast timeframe. Increasing product demand for water sporting, campaigning, and boat racing events owing to high speed, improved stability, and ease of its maneuverability are among the prominent factors fueling the segment growth. These are featured to have an average speed of 300-400 nautical miles per day. Surging adoption of high-performance boats in World Cruising Events organized by Atlantic Rally for Cruiser will fuel product demand due to the restricted use of powered boats in the rally. North America catamarans market size is projected to generate 3.5% CAGR by volume over the forecast period. Surging expenditure on luxury boating such as yachts, powered cats, cruisers, and others are positively driving industry growth. The regional growth is mainly contributed by the U.S. demand owing to higher income spending on recreational activities specifically in the boating sector. 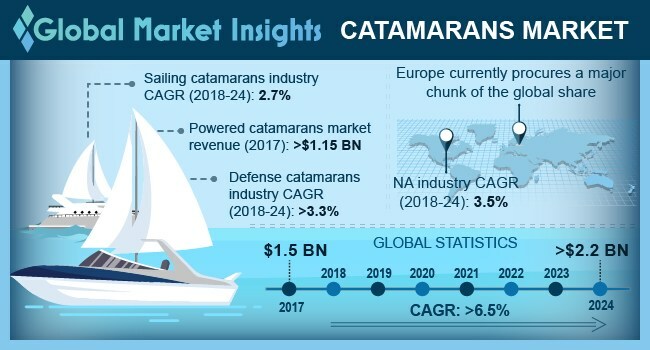 Europe holds largest share of the global catamarans market production industry owing to advanced manufacturing infrastructure required for world-class product ranges. Moreover, the region is attributed with the most experienced work force that in turn highly influences the inclination of consumers for high end performance ships. Owing to this, Europe is expected to account for largest share of the overall industry over the coming years. Global catamarans market share is fragmented in nature owing to presence number of companies offering product range across several countries. Major companies include Outremer Yachting, Grup Aresa Internaciona, Catana Group, Fountaine Pajot, Robertson & Caine, and Lagoon. Other key players are Matrix Yachts, African Cats, LOMOcean Design, Seawind, Incat Crowther, Voyage, Alumarine Shipyard, Bavaria and LeisureCat. These companies are focusing on improving structural stability along with developing high speed boats for sporting performance in reducing sailor risk in high-quality product range.